Ryanair has told cabin crew staff based at England’s East Midlands airport that due to a winter reduction in aircraft, all Customer Service Supervisors must take a six-week block of unpaid leave. They can avoid this by accepting six weeks secondment to bases with spare capacity in Eindhoven, Cologne and Berlin. However the staff must pay for their own hotels and meals during that period. If they reject this offer, they will not be paid for six weeks, and will not be entitled to statutory payments due to turning down alternative work. 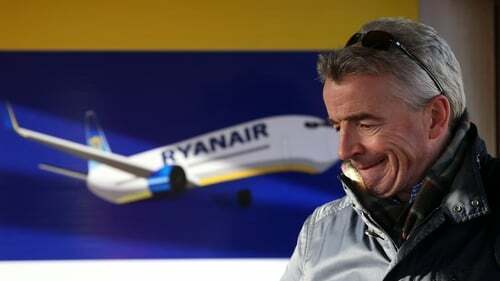 The airline's Chief Executive, Michael O'Leary, has personally apologised to the airline's workforce for reputational damage caused by what he described as the "mess" over flight cancellations. Mr O’Leary has also pledged to meet all Employee Representative Councils over the coming weeks to discuss their grievances. In a broadcast to staff over an internal channel, he said management were sorry for visiting the crisis on their frontline teams, including pilots, cabin crew, check-in staff and customer service personnel, and praised their work in recent days. He said that by the end of this week they expect to have re-accommodated 95% of affected passengers, or provided them with refunds. He thanked those pilots who had been working on days off over "weeks and weeks and possibly months". He said Ryanair had not understood that rostering numbers were low - and had certainly mismanaged the allocation of the four-week blocks of leave to pilots in September and October when they were still running the summer schedule. He told staff that management were being assured during the summer that they had enough pilots when they clearly did not have enough to be able to allocate leave during those months. He confirmed that Ryanair will be writing to pilots over the coming days asking those allocated a four-week block of annual leave in October, November or December to please work one of those four weeks. He pledged to protect the other three weeks of annual leave, and allocate the fourth week later in the year. He said Ryanair had already engaged in discussions on the problems in bases including Dublin, Stansted, Berlin, and Frankfurt, where they either have a shortage of pilots or a risk that some pilots may be leaving to join other airlines. Mr O'Leary described the situation where over 100 pilot recruits had been awaiting base training as a "mess" - but said they were about to clear that backlog by Monday or Tuesday, with 125 new pilots on the rosters from next week. He said he and the rest of the management team would be working very hard to fix the current rostering failures and ensure they did not happen again. He concluded by thanking them for all their hard work during the last couple of difficult days, gave them his best wishes, and urged them to keep flying safely. Meanwhile, Ryanair has said that all passengers that had their flights cancelled up to the 28 October were notified on or before Monday the 18 September, and that any cancellation after 2 October will not qualify for compensation. In a statement, Ryanair said that "any cancellation between 10 September and 2 October included which were cancelled due to Ryanair's scheduling issue will be entitled to compensation." However, anything after that date will not qualify. Ryanair say they have assessed all the impacted flights within the 14 days, and have "identified all passengers who qualify for compensation." The airline said that on 10 September and 12 September there were some cancellations due to thunderstorms in Italy and the French ATC strike. They have stated that these passengers will not be entitled to compensation as these issues were outside of Ryanair's control, but all other flights within the 14 days are entitled to full compensation. There are fears that Ryanair may be preparing to take back leave already allocated to pilots in a bid to ease the cancellations crisis at the airline. This morning Ryanair issued its latest rosters to staff but instead of confirming shifts for four weeks in advance, details are only given for the next three weeks. Yesterday, Ryanair CEO Michael O'Leary said he was prepared to take back allocated leave with or without consent if necessary to address staffing difficulties caused by a backlog of leave entitlements. Meanwhile the pilots' deadline for Mr O'Leary to respond to their demand for negotiations on better contracts has expired. So far 55 of Ryanair's 86 bases have rejected Ryanair's offer of additional pay and deferred bonuses to give back leave. The next step by either management or pilots remains unclear.